Professors use 3D-printed models such as these to demonstrate mathematical equations and concepts in undergraduate courses. Nate Barlow and Steve Weinstein are making waves. This year they began making and using 3D-printed models of mathematical equations to illustrate wave systems and other fluid dynamics concepts as part of their research. They’re also using the models in undergraduate math classes. “Implementing 3D-printed items helps make visual some of the complex math solutions we create in research. It also appeals to those students who may have trouble seeing surfaces in our classes,” said Weinstein, a professor of chemical engineering in the Kate Gleason College of Engineering. He and Barlow, assistant professor of mathematics in the College of Science, are research partners leading the Asymptotics and Wave Instability Group, modeling wave phenomena to understand how growing waves could impact manufacturing processes or how sound waves, or turbulence, affects aircraft, for example. The faculty had a eureka moment more than a year ago when a student in the wave lab produced several 3D-printed models of wave dispersion, such as three-dimensional images of ripples on a pond. “Who would have thought to connect these things and in such a unique way? This is going to help a lot of students visualize, in 3D, in a way they could not do before,” said Weinstein. Barlow uses a series of models for his math course, Boundary Value Problems. 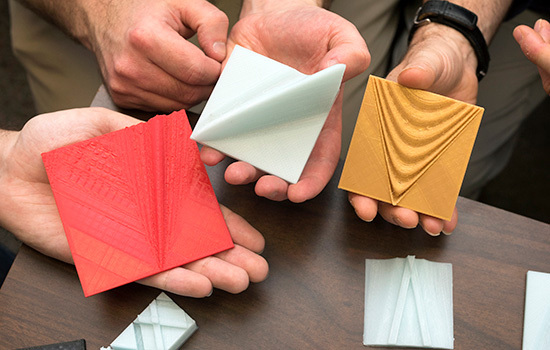 3D-printed models are designed in MATLAB illustrating multiple dimensions—height, speed, time—variables used when solving differential equations. Students view model sequences of individual, three-dimensional features representing a comprehensive view of the solutions over time. Students pair boundary conditions with the printed objects or assemble a series of models to illustrate different physical concepts. “3D printing is probably the most novel method for bringing thought to life,” he said.